Frankie hasn't had a proper relationship for years. But though she tells everyone this is how she wants it, but secretly she's in love with her best friend Patrick. Tor didn't think she could have a baby, but now she is pregnant by her younger lover. Could this mean the end of a romance that has started to mean more to her than she expected? Leila seems to have it all - a happy marriage, a beautiful daughter and a successful career. But Leila is harbouring a secret that could destroy her marriage forever. On an idyllic Greek island, the three women try to keep their secrets hidden. But emotions are running high, and when an unexpected guest arrives, events start to spin out of control. Although I am not a Katie Price fan I have enjoyed her novels, and when I found out that the author of Swimming Pool Summer is the same author who is Katie Price’s ghost writer, I was looking forward to reading a book by Rebecca Farnworth which is published under her own name. The story follows three friends Frankie, Leila and Tor. Each have a completely different love life. Leila is married to husband Tom and has a beautiful daughter Gracie. From the outside Leila looks to have the perfect love life but there are cracks that her friends cannot see. Tor is dating the gorgeous Ed but he is a lot younger than her and age seems a big problem to Tor even if it means nothing to Ed, and if this wasn’t enough some big news puts Tor on edge too. Frankie is single, she has held a torch for their friend Patrick for a long time now but the feeling doesn’t seem to be mutual. The friends all embark on a holiday in the sun together, but will this sort their problems out or will it only make things worse? I couldn’t have read this book at a better time, looking out and seeing the wet and windy weather I needed something to cheer me up as I started my week holiday and this book sure done the trick. All three of our main characters were fantastic although Frankie was a little bit if a hard character to warm to at first! I loved them all equally and they seemed to have a nice bond between them. The chapters alternate between the women so we get to know each of them first hand and we get to know their thoughts and their problems even though their friends do not know so I felt like I was one of the girls having hidden knowledge! The storyline and the situations the women found themselves in were very believable which I loved, and the author creates a great mix of holiday fun along with the problems that the women have so the book still keeps a light hearted feel to it. The authors writing style makes this book a very easy fast paced read perfect for holiday reading. The small descriptions of the villa were enough to want to whisk me away, I only wish there were more descriptions like this to set a perfect scene. 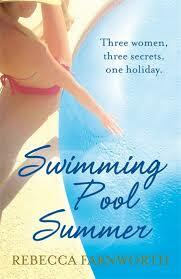 I really enjoyed this book and it is nice to be able to give Rebecca Farnworth the credit she deserves as an author. I love forward to reading more books under her own name in the future. From the outside Leila looks to have the perfect love life but there are cracks that her friends cannot see.